Gilded Balloon is one of the big Fringe venues based in the Teviot building on Bristo Square with additional venues in the National Museum and on Rose Street. Barry Cryer: When Richard met Barry Charlie Baker: And the wedding band play First Fringe Firsts presented ThreeWeeks Survey: Fringe flu is incoming, how to survive ThreeWeeks Survey: Sit back, relax, and read the reviews ThreeWeeks Survey: You have the words, what about the music? 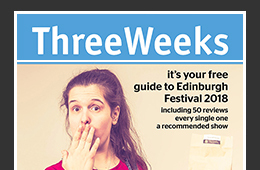 Felicity Ward: In the comedy ward Fringe Emergencies - Maeve Higgins eats Fringe Emergencies - Tom Allen chills Hardeep Singh Kohli: Janey chats up Hardeep Jarred Christmas: Christmas Time comes early to Edinburgh Karen Koren, Gilded Balloon: Flying high Tara Flynn: What’s that noise?